Want to do a better job of helping your clients plan their financial future? NitroScore, a powerful online and no-cost tool for determining the affordability of student loans can do just that. Using NitroScore, students and families can compare different options by selecting a college and major to get an immediate NitroScore, showing whether they are in the green, yellow or red zone for managing their college loan repayments. They can then customize the results, adding in scholarship or grant offers from the schools, contributions from 529 plans and other savings, aid from additional sources, and even gifts from family members, which gives them a real time look at their potential loan repayment situation. As a financial professional, you understand the competitive nature of our market. Clients want more value from their relationship with a financial planner or wealth manager. They want their advisors to plan for their entire lifecycle, including one of the biggest expenses your clients will ever face: Their children’s college education. Let NitroScore help you enrich the financial planning process. Using real-world data on college costs and after-college salaries, NitroScore is an important, new online college planning tool that allows advisors to help their clients make informed decisions and find the best values in American higher education. It enables you—a trusted advisor - to create a personalized ranking of a prospective student's college and major choices - based on the predicted ability to repay student loans after graduation. 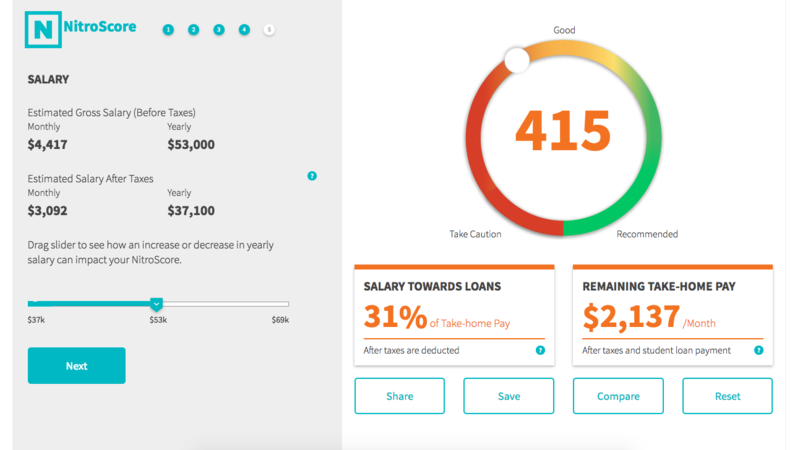 NitroScore adds one more valuable tool to your financial planning portfolio—a way to connect with the next generation while providing better engagement with the families you advise.